Coastal Kitchen is pairing up with local breweries to host this tap takeover event. We are also working with Tradewinds The Band to raise awareness to local charities and Long Island companies. During this event, we will donate $1 from every participating brewery’s beer that we sell. Each brewery will pick a charity of their choice to donate their earnings to. During this tap takeover, Coastal Kitchen will serve beers from an outstanding selection of local breweries. 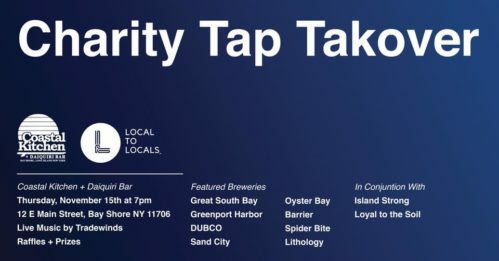 These breweries include DUBCO, Greenport, Barrier, Sand City, Oyster Bay, Great South Bay, Lithology Brewing, Loyal To The Soil, Spider Bite, and Island Strong. Some of these breweries have already selected the charities they will donate to. Some of these charities are the Surfrider Foundation, the Crohn’s & Colitis Foundation, the Matthew Fitzer Foundation, The Morgan Center, John Bowne Agriculture, and the John Theissen Foundation. Enjoy live music by Tradewinds The Band, as well as delicious drinks from some of our favorite breweries, and it’s all for a good cause! Be sure you’re here for the Locals to Locals Launch Party at Coastal Kitchen. This event will take place at 7 p.m. on Thursday, November 15, so don’t miss it! You can find Coastal Kitchen at 12 E Main Street in Bay Shore.